Now you’ll be better than ever at destroying your relationships. Maybe it’s Christmas Eve and your family is gathered around the table for some quality time. Maybe there’s a power outage and you and your friends need something to do. Or maybe, if you’re like me, it’s your kinda-disappointing prom weekend. You’re playing Monopoly, and let’s be real, you’re out for blood. While it may seem random, Monopoly is really a numbers game, and like pretty much anything with numbers, it has been analyzed extensively by nerds. We’ve highlighted the takeaways from various analyses, including a recent video from mathematicians Hannah Fry and Matt Parker. First, the basics. When you go around the board early on, you should buy most properties you land on, with the hopes of either building them into valuable sets or trading them with other players. Most experts agree that you should skip the utilities, which will never be worth much; there’s more debate about the railroads, with some saying they’re worthwhile early on and others claiming they’re a waste of money. As a game gets going, players face more strategic decisions: how much to bid in auctions (which happen whenever a player declines to buy a property they land on); how to value properties in trades; and what to do with houses and hotels. That’s where math comes in. Who cares if it's not real money? They say location, location, and location are the most important factors in real estate, and the same holds true for Monopoly. To start, some squares get more traffic than others. At the top of the list is Jail, which players may be sent to if they land on the “Go to Jail” square if they draw certain cards from the Chance or Community Chest, or if they role doubles three times in a row. Another factor comes down to dice probability, with 7 as the most common result (17 percent of rolls), followed by 6 or 8 (14 percent each). The second most common landing spot on the board, consequently, is the one seven spaces away from Jail. Monopoly champion Bjørn Halvard Knappskog shared the following heatmap of the squares that get the most and least traffic. Remember it well. This heatmap shows how many times each space was visited. While many people assume that Boardwalk and Park Place are the best because they have the highest rent, they’re actually not as important as others. That’s because they’re far away from Jail and there’s fewer of them, meaning your enemies (read: beloved friends and family) probably won’t land there. Boardwalk, or Mayfair for any Brits out there, can get you the single biggest influx of cash, but it’s not worth it for how few times anyone will land on it. In fact, the numbers show that the orange block is the most valuable in the game — largely because of their choice position 6 to 9 squares away from Jail. This was verified by Fry’s theoretical modeling, as well as Parker’s simulation of a hundred-million dice rolls in a virtual game of Monopoly. After the orange block, the red properties tend to be the most valuable. Situated right after the orange tiles, they are the likely destination for people who just landed on an orange space or rolled doubles after leaving Jail. And because of their close proximity, it’s unlikely that players will be sent back to Jail before they can make the leap from orange to red. The light blue properties found right before Jail are also common, in part because of the chance card that sends players to the Go space. The light blue tiles are just as far from Go as the orange tiles are from Jail. While you can’t help whether or not you arrive at and get to buy a given property, your friends probably won’t know the value of the orange block. If someone else gets there before you, watch their eyes turn into dollar signs when you offer them Park Place in exchange for a bunch of supposedly worthless orange spaces. This is the most lucrative corner of the board. If you want to get the biggest return on your investment, you should build three houses at a time on your properties. Across the board, this is the quickest way to make back more than what you’ve spent. Each house placed on an orange property costs $50, but each house adds way more than that in rent. With one house, the orange property St. James Place’s rent jumps from $14 to $70, and each subsequent house adds even more value. The biggest jump is between two and three houses, which raises the rent from $200 to $550. While a fourth house and hotel will increase the rent to a maximum of $950, the increase per house is lower than that of the third house. For some properties, like the orange block, a fourth house and even a hotel can be worthwhile because your opponents are more likely to land there throughout the game. But for the other properties that are likely to see less traffic, extra houses are a waste of cash. Not only do the numbers show that having three houses yields the biggest return, there’s also a strategic component as to when you buy them. If you want to save money until the last moment, you should wait until your opponents are — you guessed it — about seven spaces away from your property before adding any houses. That way you’re not spending any money until the very last moment before you would collect rent. This heatmap shows which investments you'll recoup fastest. Darling also calculated how expensive those investments are. The light blue and orange properties stand out as being particularly cheap, while the green are particularly expensive. This heatmap shows how expensive difference investments are. As great as three houses are, there’s an argument to be made for buying four, and the math behind it is as simple as counting to 32. That’s the amount of houses that come with the game. According to the official rulebook, you cannot just add more houses into the game when you run out of pieces. So if you want to truly, perhaps irreversibly, anger your friends, get your four-house clusters early so they don’t ever get to buy some of their own. That’s a technique endorsed by UK Monopoly champion Natalie Fitzsimons . Of course, at that point you should be ready to throw down in a literal fistfight. I don’t think your enraged opponents will care that it’s a UK champion-endorsed move. Hanging out in Jail might not be such a bad idea. After all, you never pay rent. 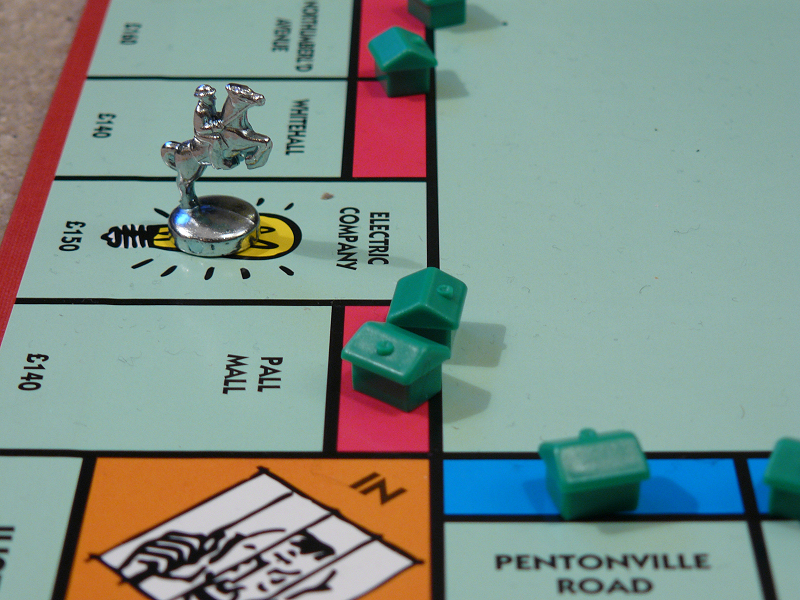 Because the spaces after Jail are the most valuable in the game, Fitzsimons points out that the longer the game goes on, the smarter it is to wait in Jail for as long as possible. She suggests using “Get Out of Jail Free” cards early in the game when there are still unclaimed properties to aim for. But when the board is all bought up, Fitzsimons says that you should try and get out of Jail by rolling doubles instead of paying bail. The longer it takes to get free, the longer your opponents are running around the board and potentially landing on your properties while you can’t possibly land on theirs. You can’t hide in your cell forever — you’re forced to pay bail if you don’t roll doubles within three turns — but by buying yourself that extra time you should have racked up a bit of extra rent money from your opponents on the outside. You'll probably be here quite a bit.